Four teenage friends from a quiet and peaceful suburb are determined to discover the truth about their neighbor, who they believe to be a serial killer. Another well-crafted 80's homage. For fans of 'Stranger Things'. Summer of ’84 is directed by François Simard, Anouk Whissell, Yoann-Karl Whissell and was released on Aug 10th, 2018. 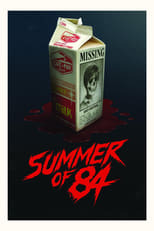 Director François Simard, Anouk Whissell, Yoann-Karl Whissell's Thriller & Mystery movie Summer of ’84 is produced by Brightlight Pictures & Gunpowder & Sky & was released 2018-08-10.